Add the remaining bananas and sprinkle the cacao powder or shaved chocolate on top. I have fond memories of making a version of this dessert with my Mum when I was a kid. Traditionally Banoffee Pie is made with a digestive biscuit base, a condensed milk toffee layer, bananas and whipped cream. To make the toffee layer we would place the unopened tin of condensed milk into boiling water and boil it for 3 hours! 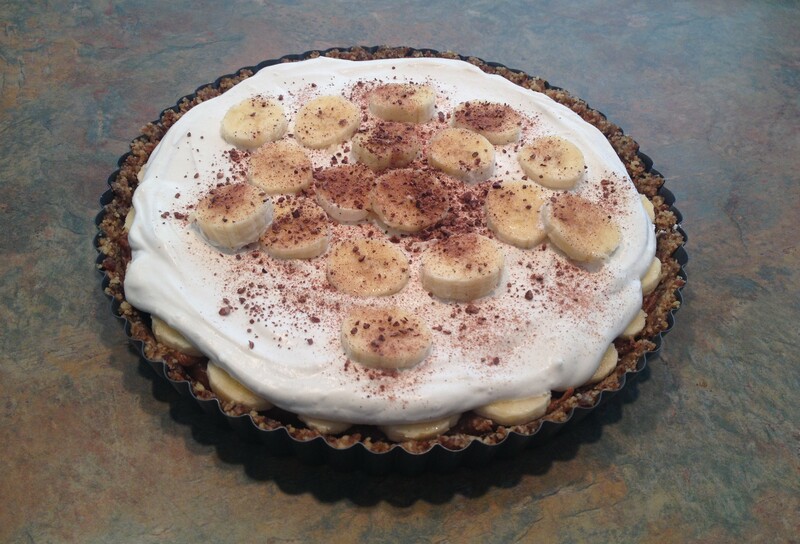 Now we are vegan we can enjoy this easier-to-make and healthier version of Banoffee Pie. This recipe is mostly dates, nuts, bananas and coconut and is dairy free, grain free, refined sugar free, salt free and oil free. It’s easy to make and can be made in less than an hour. See recipe below! For the base: Blend nuts, dates and cinnamon in a food processor until crumbly and so it sticks together when you press it. Transfer mixture to 9″ pie dish, spread evenly and press down so the top is smooth. For the toffee: Add pitted dates into a bowl and pour boiling water over top. Let sit for 5-10 minutes, or longer if your dates are firm. Drain the dates well and add to a blender or food processor along with the almond butter, lemon juice, salt, and vanilla. Blend until smooth. Slice all the bananas and cover the toffee later with one layer of bananas, pressing down lightly. You can save some bananas to put on the top of the pie or if you prefer you can put all of the banana slices in this layer. Get the cans of coconut milk from the fridge. Open the cans and carefully scoop off the white cream from the top of the can, discarding the water (depending on the brand you’ll get 1/3 to 2/3 of a can’s worth of of cream out of the can). Add the coconut cream into a medium bowl. With a whisk or electric beaters beat the cream until smooth. Spread all of the coconut cream on top of the banana slices in an even layer. Add the remaining banana slices on top and garnish with sprinkled cacao powder. Serve pie immediately. Store leftovers (if there are any!) in the fridge.